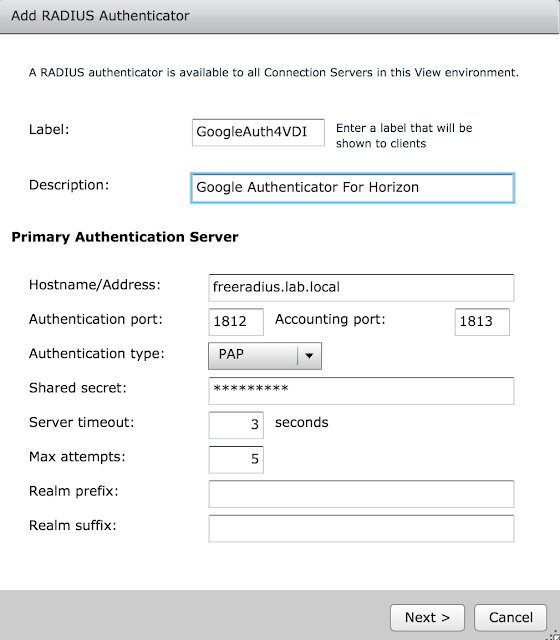 While looking for a free RADIUS solution for my VMware Horizon lab I came across this white paper, "How To Setup 2-Factor Authentication In Horizon View With Google Authenticator." While I was able to stand up the solution detailed in this white paper, holly cow, it was a lot of work. 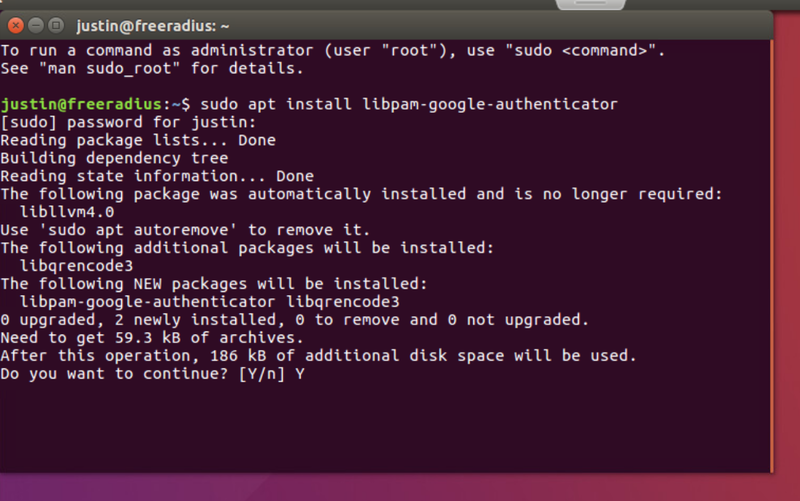 Between the Ubuntu administration, the version changes and name changes, it was pretty rough. So I documented my entire setup process and put together this updated guide. 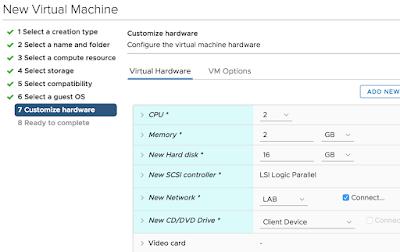 I think a typical VDI admin could stand this solution up in an hour or two by following this procedure, assuming they had all the required access rights and resources lined up. 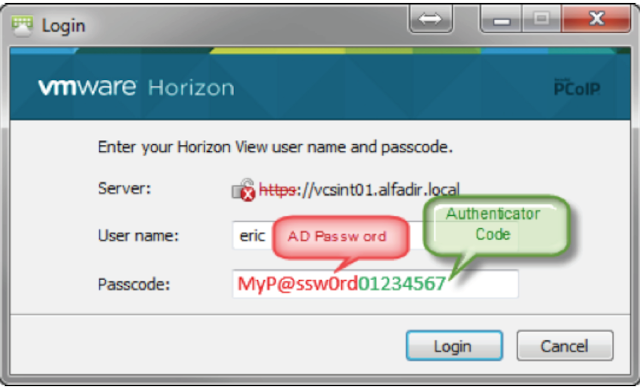 Here's a basic outline of the steps required to integrate Google Authenticator with VMware Horizon through FreeRADIUS. Further below are the detailed procedures. 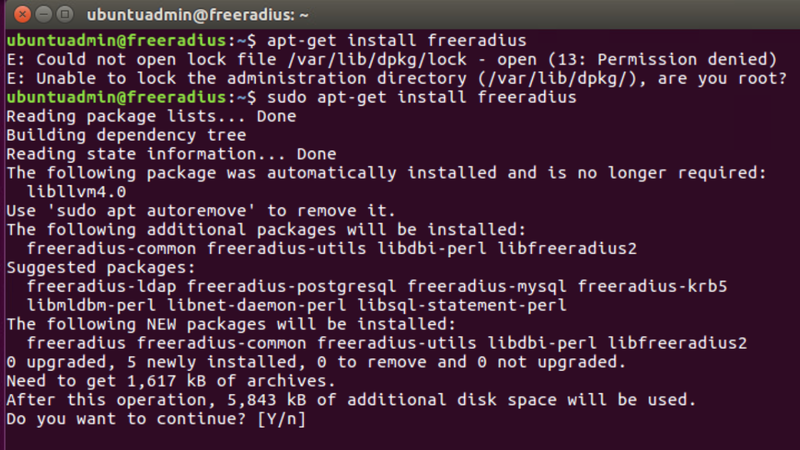 Ubuntu is used to run an open source RADIUS solution, FreeRADIUS. This instance of FreeRADIUS is integrated with a local install of Google Authenticator, then configured to act as a RADIUS server for a Horizon Connection server. The end result is two-factor authentication for our Horizon environment for free. 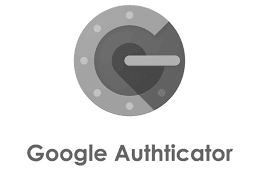 Directly below is an excellent graphic that represents how Google Authenticator works. 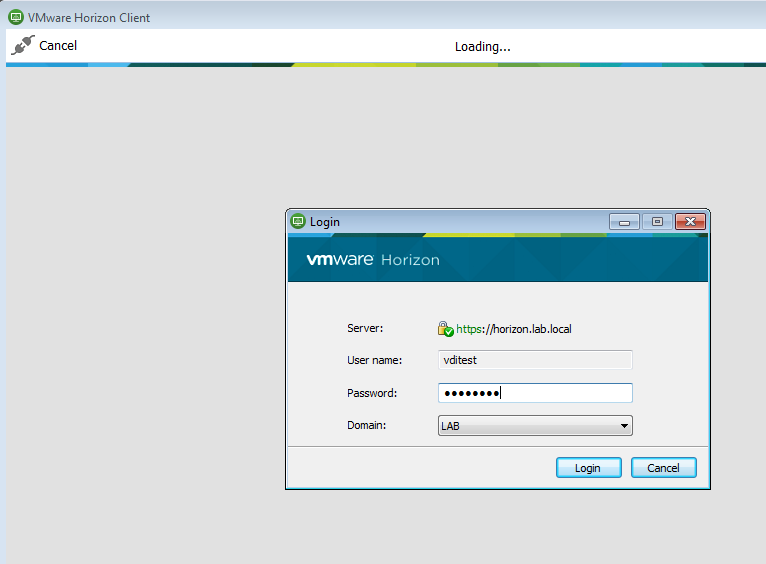 Then below that is my own rendition of what the entire integration with VMware Horizon and UAG looks like. Upload the ISO to a shared storage location easily accessible from the VM you're creating. With the vSphere Web Client create a new VM in a location that's appropriate. 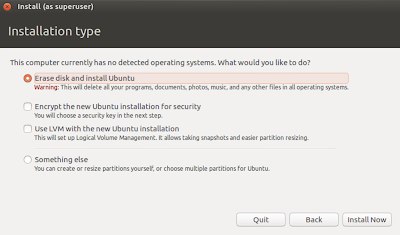 When it comes time to select a a guest OS type go with Linux, Ubuntu Linux (64-bit). 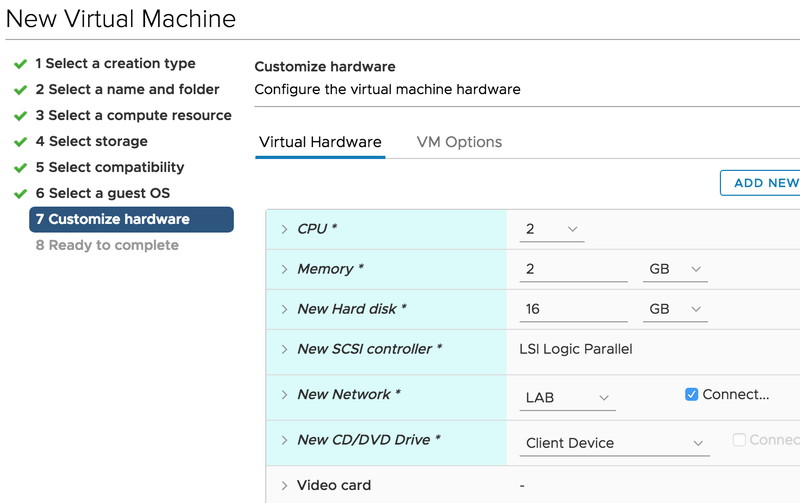 In terms of basic specs for the VM, go with 2vCPU, 2 gigs of RAM and 16 gigs of space. Most importatnly, configure the VMs CD rom to point to the Ubuntu ISO and ensure it's configured to, "Connect At Power On." 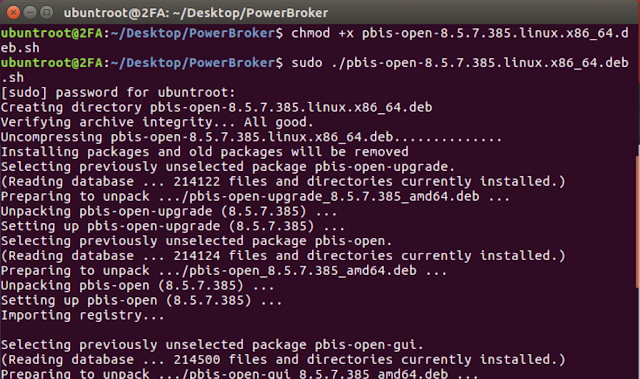 You're going to boot from that ISO to proceed with the upgrade of Ubuntu. 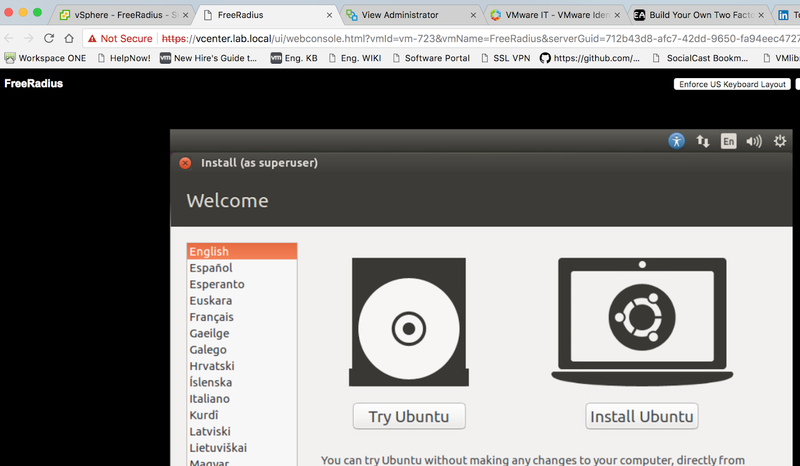 If everything goes properly, at power on you'll see the Ubuntu welcome menu within the newly created VM. 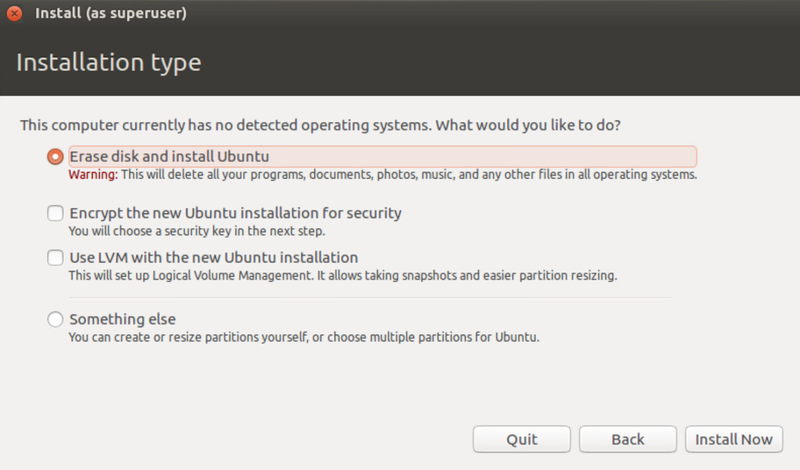 Proceed with the, "Install Ubuntu," option. Walk through the wizard, selecting keyboard type and time zone. Chose to go with "Erase disk and install Ubuntu," as the installation type. Finally, the hardest part of the setup. Give the computer a name and setup your admin account. Stick with the option, "Require my password to login." 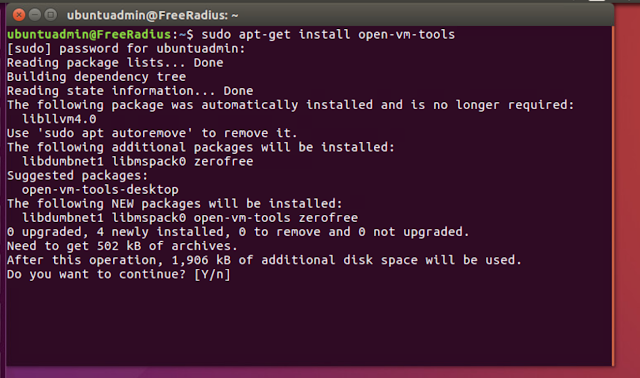 At this point, the wizard complets and you've got your Ubuntu OS installed. 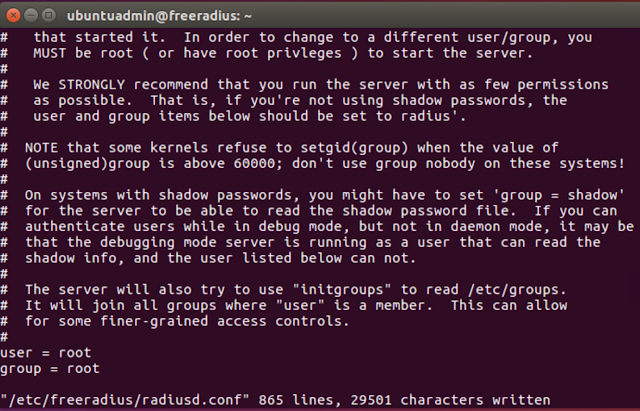 Finally, while we're at it, we can setup OpenSSH as well. 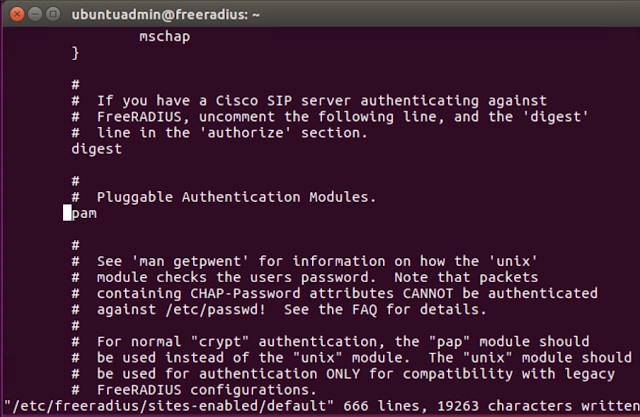 To enable domain membership we need to confirm that networking and DNS is all sorted out. To that end, it's a good idea to assign a static IP address to our new system and manually create a DNS record for it. From there we can use ping and nslookup to ensure everything's straight. 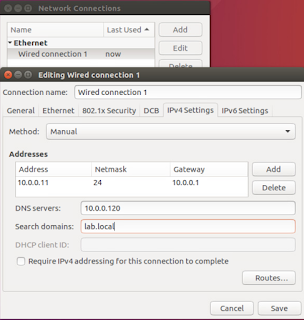 You can configure a static IP address using the Edit Connections option at right hand corner of screen. 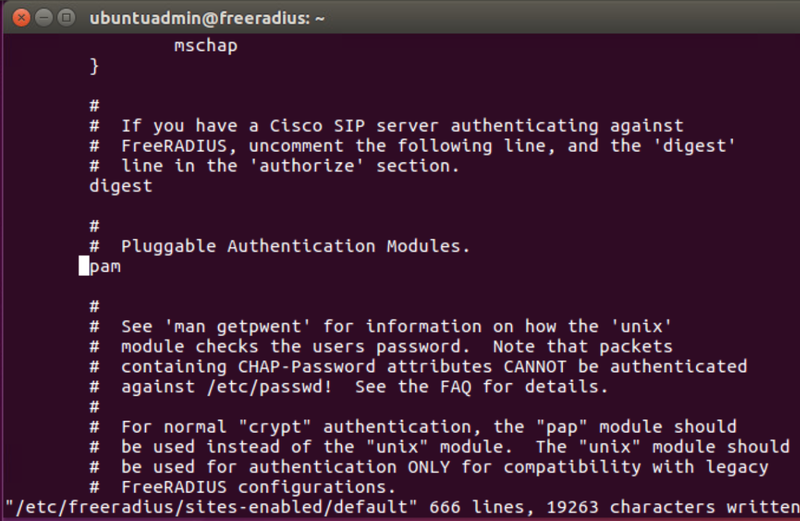 Click save and disable\enable the nic for the new settings to kick in. Upon initial setup in my own lab I ran across a really strange DNS issue. 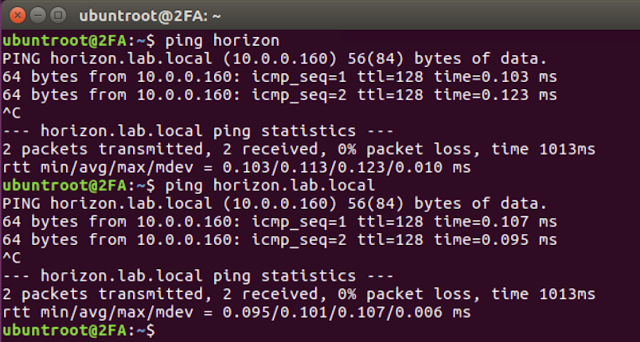 While I was able to ping domain members by their short name, for some reason DNS resolution of the FDQN was failing. Here's an example. I was able to get this issue resolved by editing /etc/nsswitch.conf, changing the hosts: line so that it includes only files and DNS. After making this change the FQDN started resolving properly. 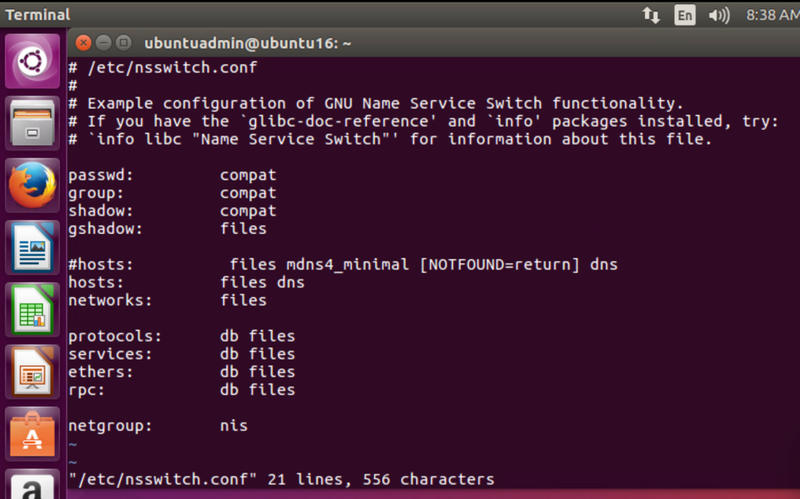 Along with testing network connectivity and DNS resolution from the Ubuntu system to all relevant systems in the domain, I would also confirm that the domain controller you're going to join can ping and resolve the Ubuntu system. 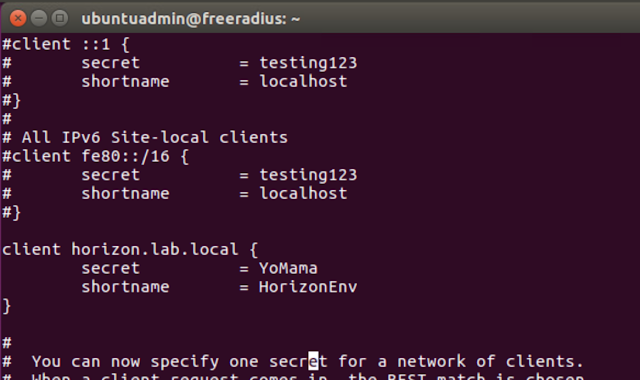 Finally, for extra credit, I would use nslookup on Ubuntu to confirm that a lookup against the target domain yields the addresses of domain controllers. With network connectivity and DNS resolution all squared away, you can proceed with joining the system to the domain. 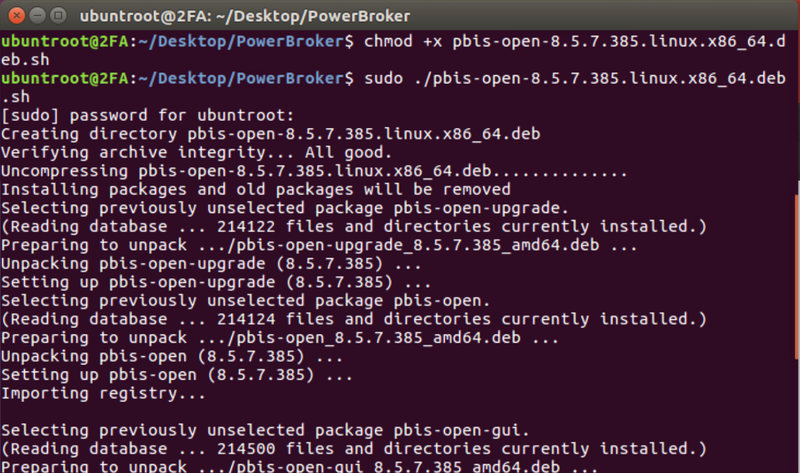 Download the PBISO solution from https://www.beyondtrust.com/products/powerbroker-identity-services-open/ Extract the files, make the script executable and then execute it. 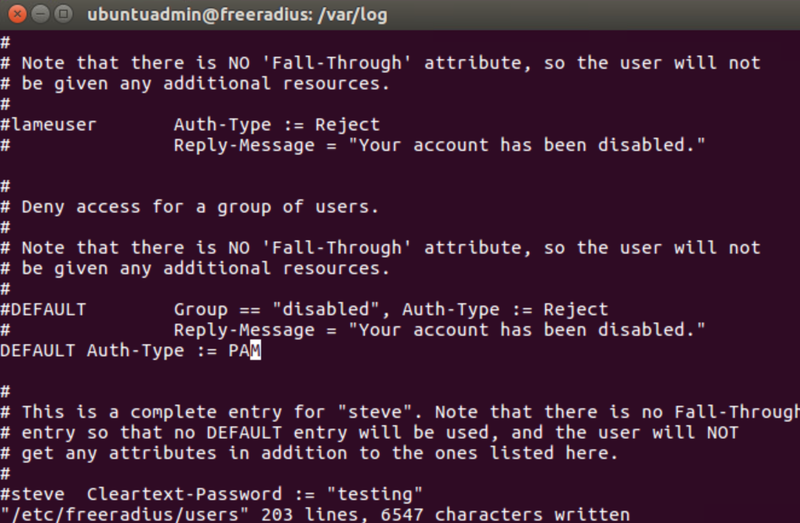 After a reboot of your system you now have the option to login with a domain account over SSH. 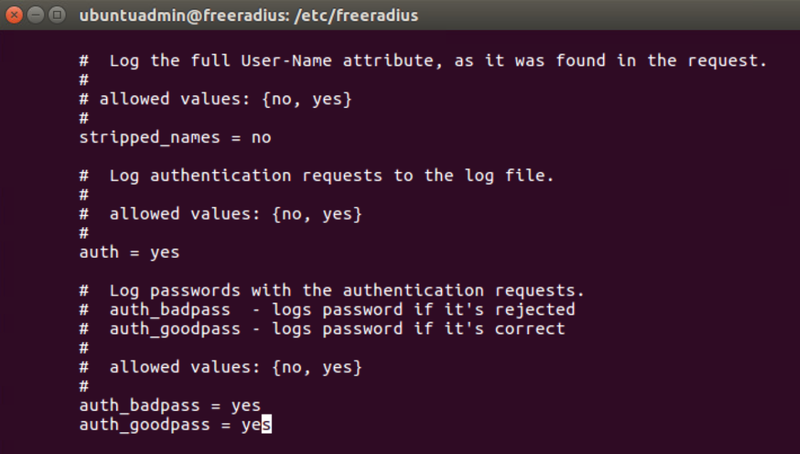 After adding these entries to 50-unity-greeter.conf and rebooting you can login with your AD credentials directly through the Ubuntu login screen. At this point, you can begin enrolling users who have the Google Authenticator mobile app on their phones. 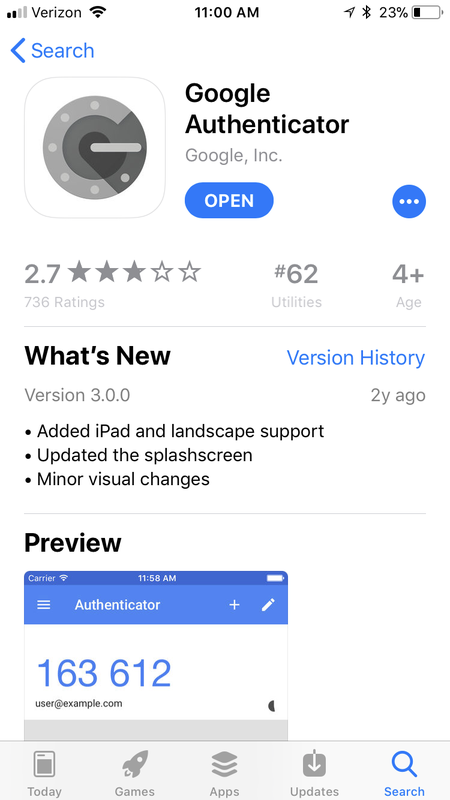 They should be able to download the app from their device manufacturers app store. On the ubuntu system login as root. 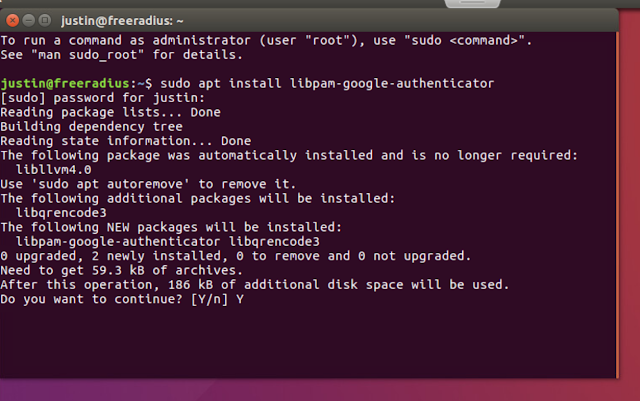 Then use su to switch to whatever user you want to enroll, and run "google-authenticator," under their context. You'll initially be prompted if you want tokens to be time based. Select yes. 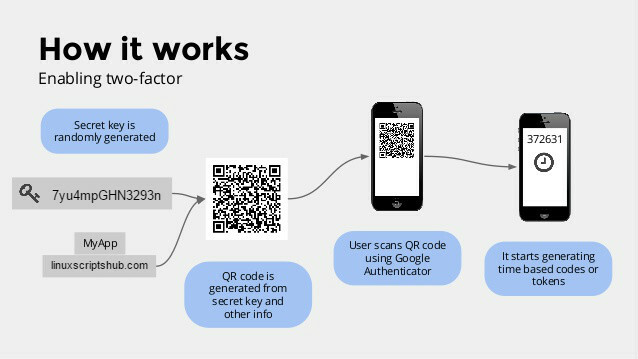 Afterwards, a QR code will be displayed. 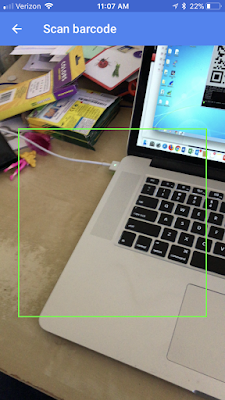 Position the green box overlay over the QR code. After successfully scanning from your phone, ensure you complete the wizard on your system to complete the users enrollment. 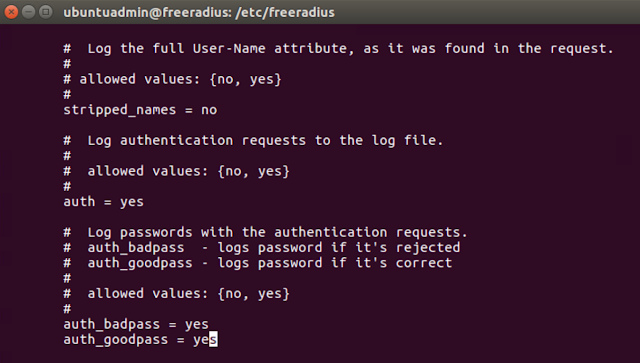 I usually answer y, y, y, n.
After making the edits above, we can now test using ssh. Taking that ubuntutest account we enrolled earlier, I ssh into the box and at first receive a prompt for my normal AD password. After entering in my password, I'm prompted for my verification code. 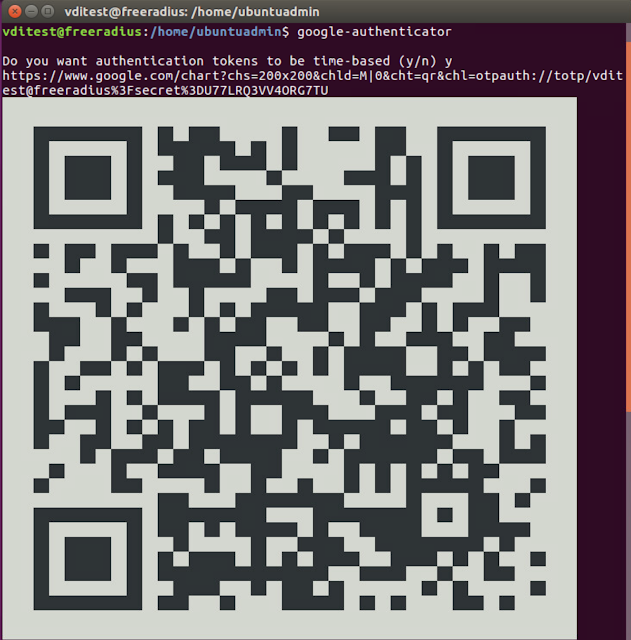 Looking at Google Authenticator I see the current verification code associated with the ubuntutest account. 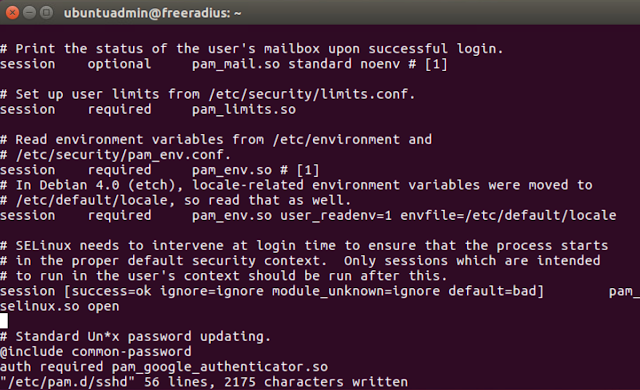 After plugging that code in I'm successfully logged in over SSH. Now we know that Google Authenticator is working on the system and we can move on to standing up FreeRADIUS. 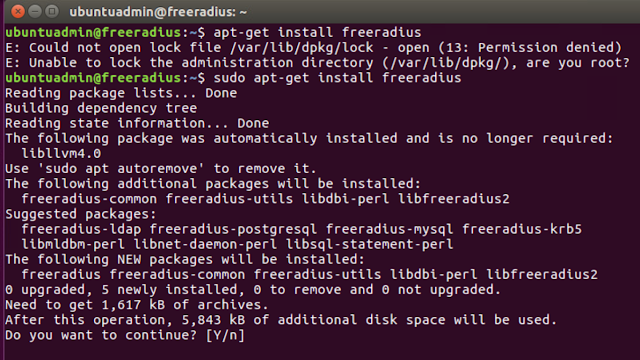 Say yes to the continue prompt and let the install complete. 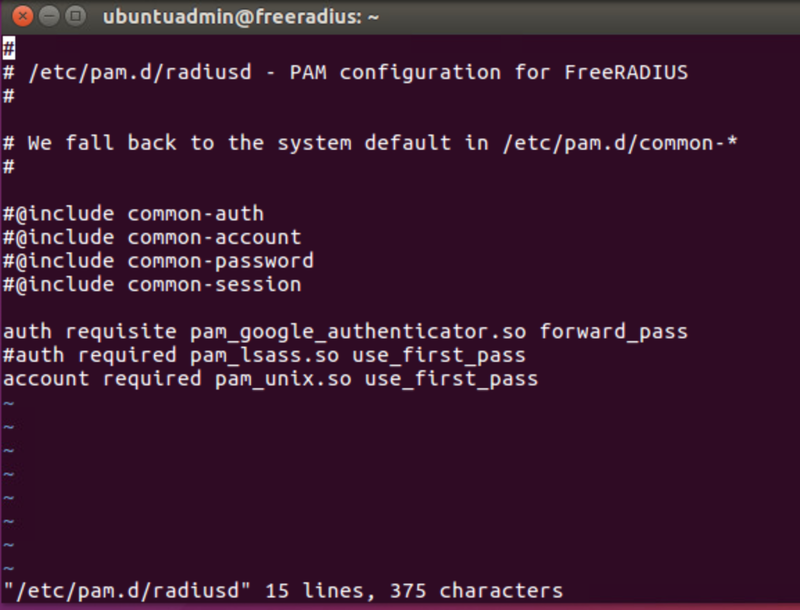 Next, we need to make an edit to /etc/freeradius/sites-enabled/default to enable PAM. 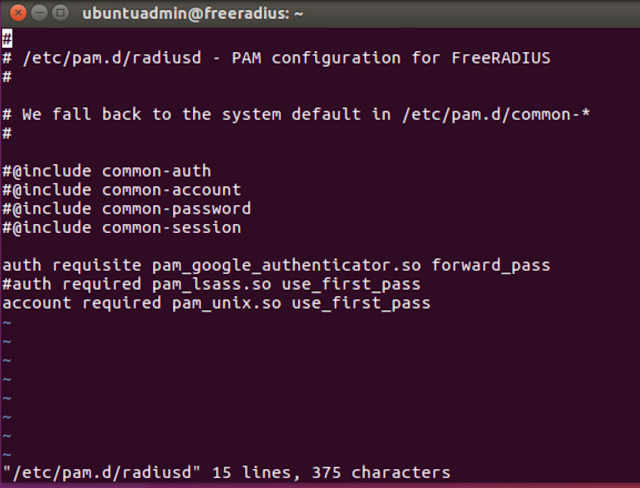 Simply uncomment out the line #PAM, so that PAM is enabled. Restart the radius server for these changes to take affect. 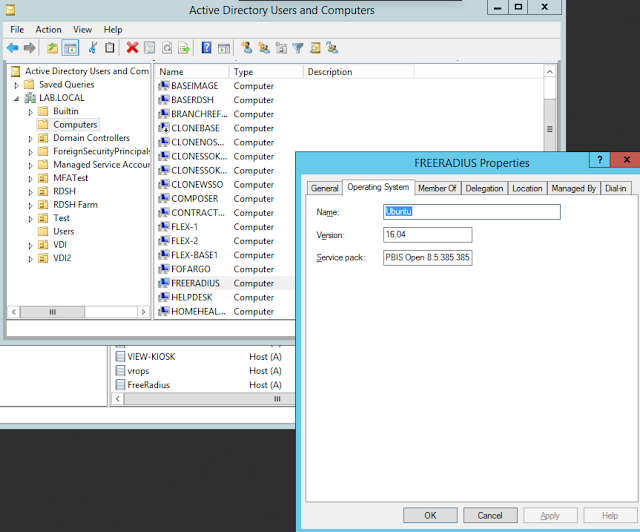 Next, you need setup the Horizon Connection server to connect to the RADIUS server as a client. 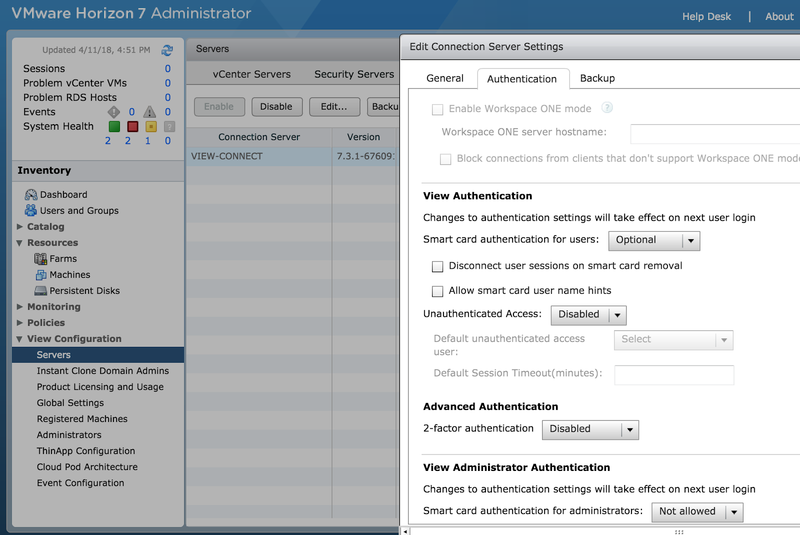 Go to View Configuration --> Servers --> Connection Servers --> Select-Your-Connection-Server-And-Edit --> Authentication tab. 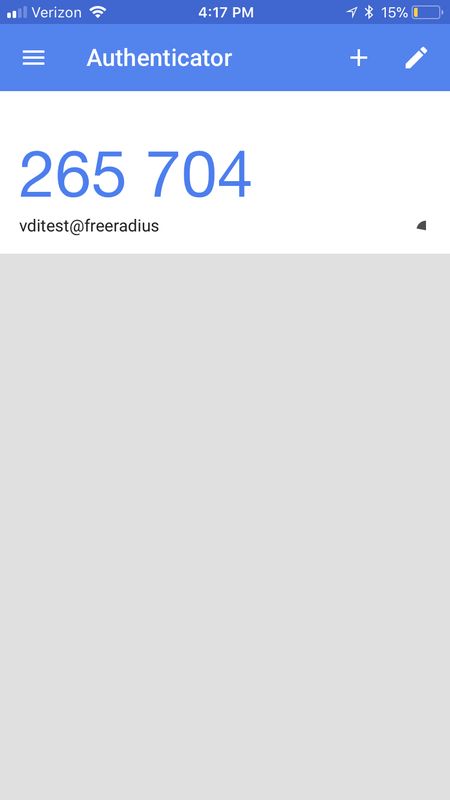 Enable RADIUS for 2-factor authentication and click on the box, "Manage Authenticator." 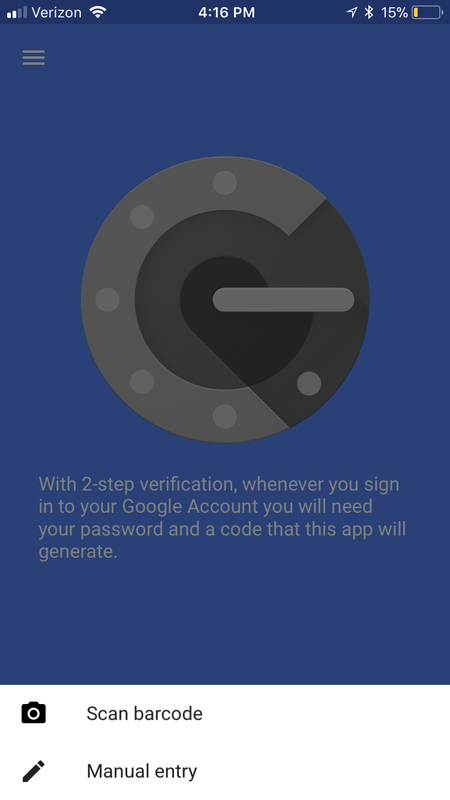 Then select the option to Add an Authenticator. 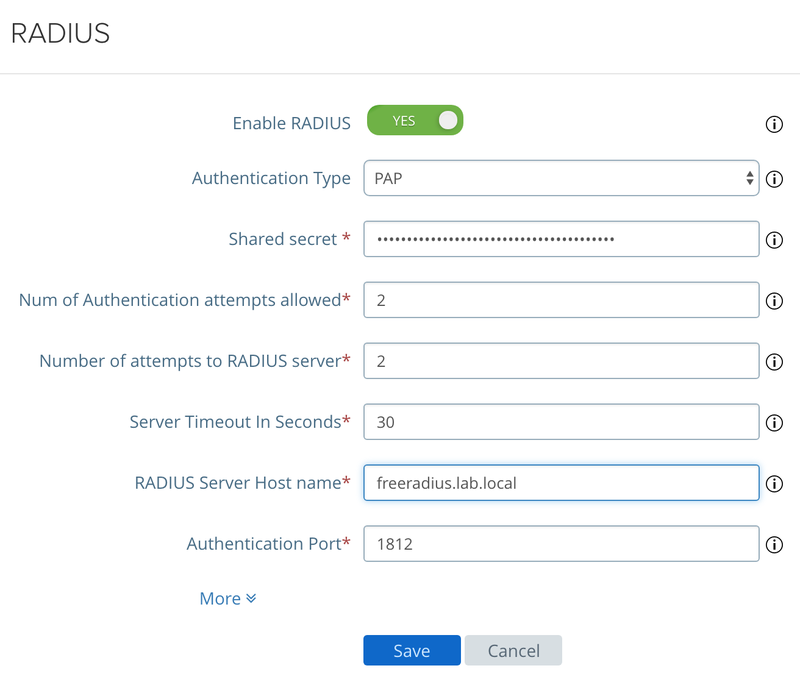 Here we're going to configure the RADIUS client settings that will be used by the Horizon Connection server to make request from the FreeRADIUS server. The basic settings required are a label, hostname, authentication port, accounting port and authentication type. 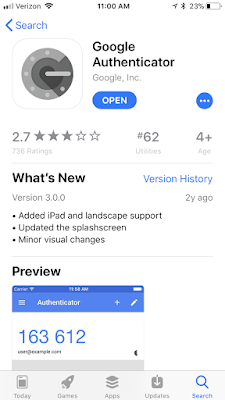 For this solution we need to choose PAP as the authentication type and go with 1812 for the authentication port and 1813 for the accounting port. 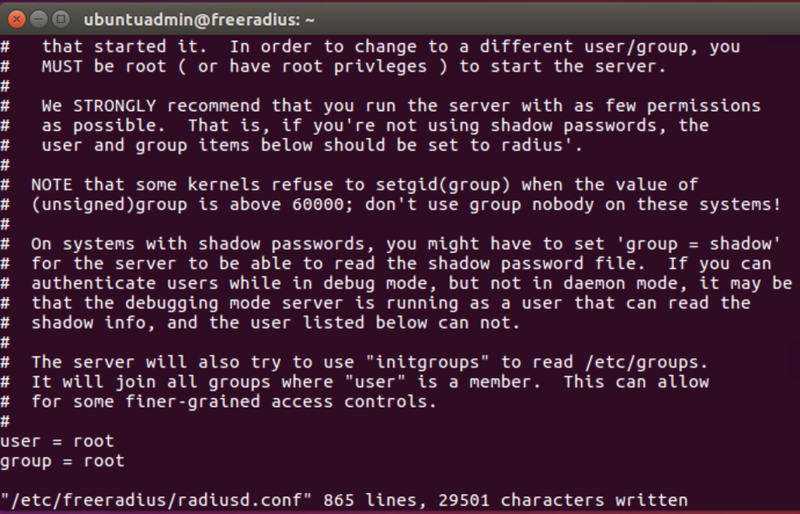 The shared secret is whatever has been configured in the FreeRADIUS clients.conf. Click next and hit okay. With the wizard complete, ensure your new authenticator is selected, and also ensure you check option for user matching. Below is what the initial login to my lab environment looks like. 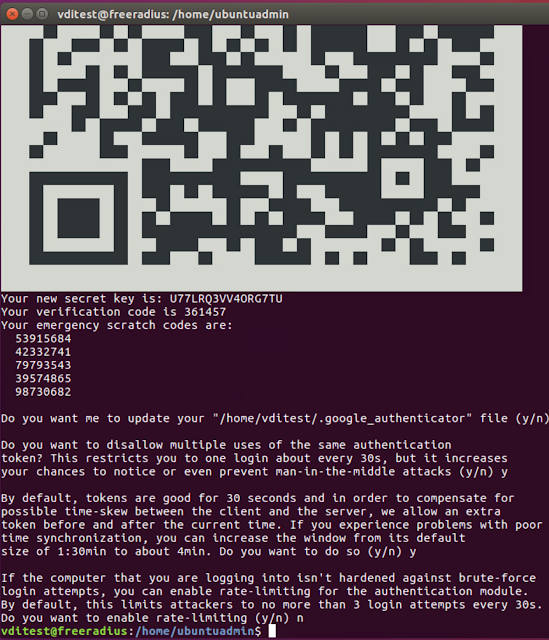 I enter in my password with a 6 digit authenticator code appended to it. 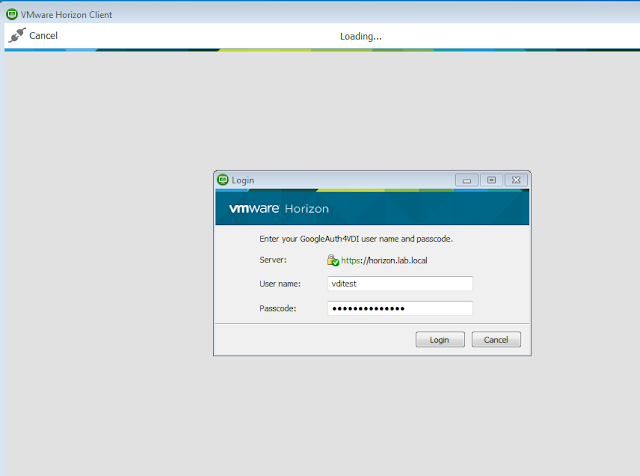 Then I get the traditional Horizon credential prompt. You simply type in your normal AD password at this 2nd prompt. 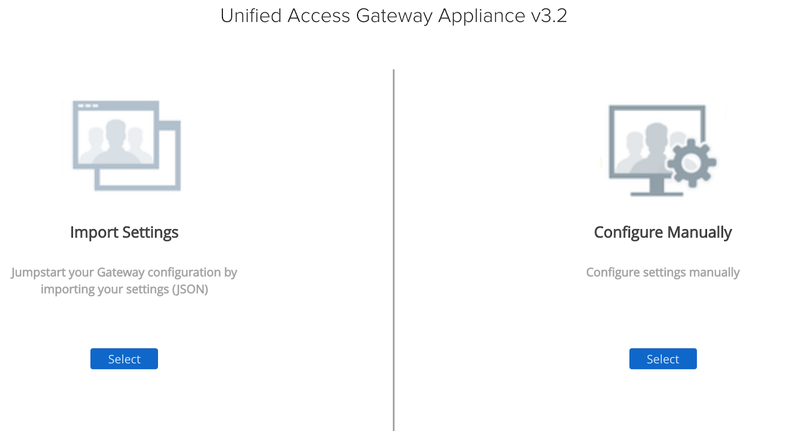 Integrating UAG with with FreeRADIUS isn't much different than integrating a traditional Horizon Connection server. First, you create an appropriate RADIUS client entry with FreeRADIUS clients.conf, just as we did earlier for the Horizon Connection server. Then login to admin gui of UAG. After the initial login, choose the option for Configure Manual. Then under general settings, expand out and select the gear icon for RADIUS. At this point, we're going to populate the same basic info we did on the connection server, RADIUS server name, shared secret, etc..
After populating all the info required for Horizon to issue requests to the RADIUS server as a RADIUS client, you're up and running.